The Enotah Echoes is publishing its first issue of the 2011-2012 academic year after a semester of intense deliberations that resulted in the formation of a campus-wide student media advisory board and new operating policies specific to the newspaper. The Young Harris College Student Media Advisory Board acts as a visionary body for all official student publications on campus. The Board provides general oversight for the Enotah Echoes as well as the Corn Creek Review literary magazine and the Enotah yearbook. The media board is composed of seven members of the YHC community. These include the Chair of the Communication Studies Department, a member from the Office of Communications and Marketing, two full-time faculty members (appointed by the Vice President for Academic Affairs), a full-time staff member from the Student Development Division, a student who is not affiliated with an official campus media organization (appointed by the Student Government Association President), and a member from the community who has journalism and/or legal experience (appointed by the President). Faculty, staff and administration also drafted the Young Harris College Media Communications Policy for Enotah Echoes, which establishes procedures for interactions with sources on campus and standards for ethical reporting. 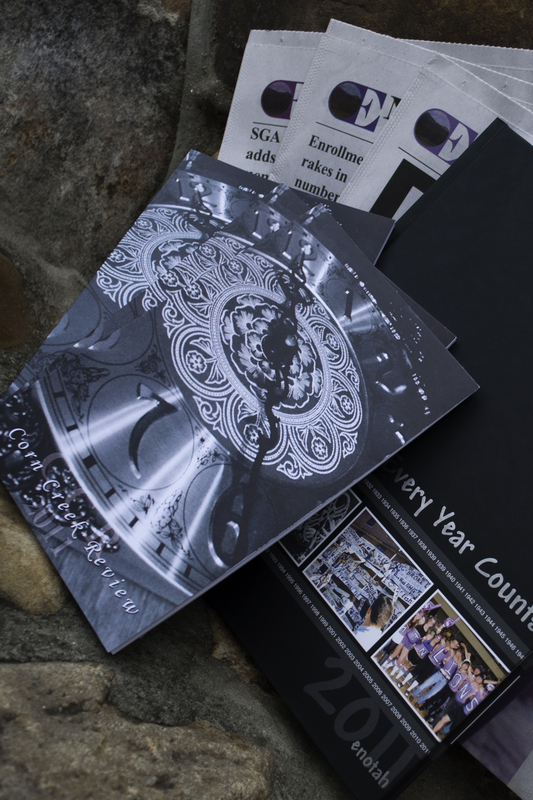 “I think we’ve done a good job putting those pieces together so that the staff, the faculty and the students can all feel comfortable that we can all go out now and put together a first-rate newspaper without worrying about liability because of ignorance or incompetence, or just basic lack of understanding,” YHC President Cathy Cox said. Discussions about the creation of a media advisory board took place during the 2010-2011 academic year, but little progress was achieved. Plans were made over the summer to work on the official establishment of a board during the fall semester; however regular publication of the newspaper had been expected to continue during this process. As a result of disagreements regarding the clarity and applicability of the Young Harris College Media Communications Policy, which outlines procedures for College interactions with all media, the Communication Studies faculty and Dean of Humanities, Ruth Looper, proposed a separate set of policies unique to Enotah Echoes. Subsequent conversations involved faculty from Communication Studies, Looper, members of the Office of Advancement, Roach and Cox. After the policies were developed, the administration made the decision to halt publication of the newspaper until a media advisory board was put in place. “We figured out that we didn’t have all the policies and procedures in place to ensure that the students, staff members and the faculty members in the College were adequately protected in terms of professional ethics and liability,” said Roach. The ensuing process and discussions were lengthy and, at times, contentious, and no formal resolution was achieved until after the fall semester concluded. The semester was fraught with uncertainty for students, faculty, staff and administrators. The staff of Enotah Echoes, who were enrolled in a course under the impression they would be consistently publishing a print edition, expressed frustration and disappointment about the timing of these decisions. Some of last year’s returning staff expressed a sense of defeat after the fall semester. Former Staff Writer Hailey Silvey, who decided not to return to the newspaper this semester, said she gained confidence during her experience last year. A high point for her was winning two awards from the Georgia College Press Association last spring for her feature article “Campus Hauntings” in the Halloween edition. New faculty member and Newspaper Advisor Theresa Crapanzano said she continually reworked the curriculum throughout the semester in an attempt to still fulfill the academic mission of the College and the promises made in the curriculum, even when publication was halted. Despite not publishing, all the students decided to remain in the course for the rest of semester. Their once-a-week classes focused on ethical issues and discussions of the role of journalism in society. “I was amazingly proud of my students and the patience, professionalism and maturity they displayed,” Crapanzano said. Still, she noted it was “heartbreaking” to see the increasing effects on the students as the semester waned. Looper said it was a trying semester for everyone participating—students, faculty, administrators and staff. Jennifer Hallett, the new chair of the Communication Studies Department and chair of the media advisory board, said despite the “growing pains,” she’s looking forward to a great semester ahead. Cox noted it is crucial to foster strong communication between the newspaper and administration. She believes the new board helps establish a better communication bridge. Roach expressed his pleasure that Enotah Echoes is resuming publication, acknowledging the important role student newspapers play on a college campus. “A strong student newspaper is an important part of the community at a liberal arts college and it serves several roles: it’s a teaching tool and a learning tool for students who are in the program, to learn how to be journalists; it’s also a way for the student community to express itself,” Roach said. The process also resulted in a refinement of duties and goals. Denise Cook, director of Communications and Marketing, was part of the discussions last semester, but, when asked about her feelings on the process and the role of the newspaper, she said she does not “have a personal opinion regarding the student newspaper’s policy or the newspaper’s image.” She noted her office is “available as a resource to help student journalists” and said any faculty and staff with questions regarding YHC’s media and communications policy can contact Communications and Marketing. The Board’s first act was to approve the Enotah Echoes mission statement early this week, paving the way for publication.